Did you Know Chem-Dry Removes 98% of Common Household Allergens from Carpet & Upholstery? Take a look at the air filters in your home. Did you know that carpet in your home also acts as a giant air filter to help trap allergens, bacteria and dirt out of the air we breathe? And just like the air filter becomes full and needs regular cleaning, so do your carpets and upholstery. You can ensure healthier indoor air in your home by keeping your carpets and upholstery clean and in good condition through regular vacuuming and having your carpets, upholstery and rugs professionally cleaned on a regular basis. When you have Chem-Dry clean your carpets and upholstery you will rid your home of common allergens and bacteria. Carpets harbor about 200,000 bacteria on every square inch. A carpet can hold eight times its weight in toxin-filled dirt and dust. A carpet can hide as much as one pound of dirt per square yard. The carpet in your home could be seven times dirtier than a city street. 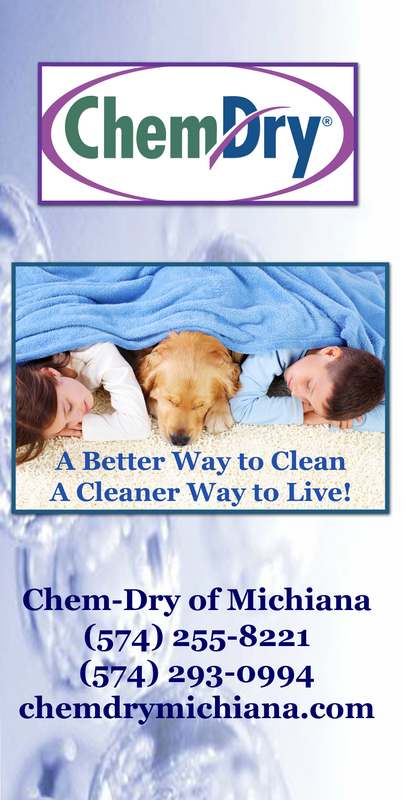 At Chem-Dry of Michiana, we want you to breathe easier about the health of your home and your family. Whether you suffer from allergies or asthma, or you just want to provide the healthiest home for your family, a Chem-Dry carpet cleaning can help you remove the allergens and bacteria hiding in your home and improve your indoor air quality. Would you walk barefoot on your carpets? Would you let your little ones crawl around? Call Chem-Dry of Michiana for a free estimate on ridding your home of common household allergens and bacteria. Despite the cold and snowy conditions right now, cleaning your carpets, upholstery, and rugs at this time of year has its advantages! Healthier Environment Inside: Since we spend more time inside, cleaning your carpets and upholstery will lead to better air quality as well as a cleaner inside. With the colder temperatures it’s harder to get fresh air to circulate inside. So it’s important to keep things clean to reduce on allergens and pollutants that will affect your indoor air quality. Chem-Dry offers quick dry times with our carbonating solutions. However, your carpets and upholstery will dry even quicker in the winter months due to lower humidity levels in the air. The dry, winter air might give you issues with your hands becoming too dry, but it’s fabulous for drying the carpets and furniture. Don’t wait too long before you clean again! You may want to wait “until the weather breaks” before you clean your carpets again, but if you wait too long, that soil in the carpet can start to damage the carpet fibers. The constant foot traffic can be abrasive if soils are left to fester in your carpet which will shorten the life expectancy of your carpet. With this being said, vacuuming also goes a long way in removing these soils! Make sure and vacuum at least 2 times per week. The good, fresh feeling a professional cleaning gives you. The satisfaction knowing that your home really is cleaner and healthier! It might be time for the winter blahs, but knowing your home is fresh and clean will give you a lift! And there is a cost savings by booking this time of year. Many people like to wait for that weather to break before they do their spring cleaning and we tend to not be as busy this time of year. However, it’s just as important to maintain clean carpets and upholstery all year long. So contact us for the best discounts of the year in February!